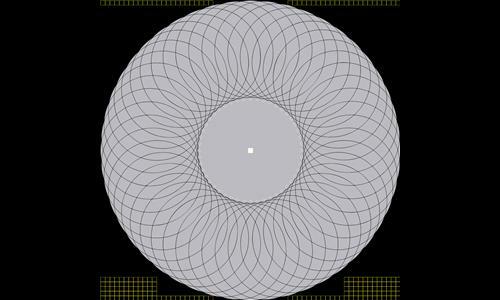 50 circles formed by 48 circles intersecting. Review by [REGL] Pooh on 3/29/2012. Interesting Map. Consider Making the Center a Negative Bonus (-5ish?). It is too controlling in the early game that touches every single bonus. I made it -10 since it would make your strategy a little harder if we were balanced out. Review by AdeptStrategist on 4/3/2012. great map especially for human players, the bonuses being bows and circles are such that the computer players are at a disadvantage, while the center negative bonus keeps players out too early, and provides a use full strategic point later on. like all large maps can grow a bit tedious at the end, but the center position allows an attack on all remaining enemy positions once it is taken that can be over in less than a dozen turns. it doesn't offer much variety, and has the possibility to grow tiresome. If you enjoy getting units based on the number of territories this is not the map for you. If you enjoy a more classical game that requires gile and cunning, this map is perfect. Review by Andalorium on 3/30/2012. I will probably work on making the circles bigger soon, right now I just made them big enough to perfectly fit two digits (20x20), next time I will probably see what can fit, like 100x100 or 50x50, as long as they don't overlap. But I don't think I will be able to change the size of the other ones farther from the center since it would distort the map too much. Review by Nathan on 5/8/2014. This map is gorgeous! Don't play with the AI, though. As usual, it can't handle negative bonuses and elongated bonus areas. Speaking of which, it is very hard to conquer an entire bonus, but once you do, the game is virtually over. It might be nice to have additional bonuses that are smaller in scope, for example a bonus for controlling a center and its two adjoining sides. Thanks for the review! I think I am going to add smaller bonuses right now. Review by [WG] Warlightvet on 4/23/2012. (example: in this game 2V2V2 one team still hasn't met anyone at turn 18 and the other 2 have been fighting since turn 2). Review by richinser on 3/31/2012. Great bonus structure with a true struggle for the center creating good competition. Thanks, I nerfed the center since the first person to get it would probably win, it is still customizable though, and it is still a very key territory late game. Review by pepe1983 on 10/14/2013. Review by JGar on 4/1/2014. Review by Shangomaru on 3/29/2013. Review by Andreco on 9/5/2013. Review by Mike Xeno on 9/11/2013. Intriguing design... not much room for innovative strategy, but interesting enough. Playing 1-player with default settings is very easy; one should change the settings for a challenge. Review by VINAYAKA on 11/26/2014. Review by GalacticExposure on 2/9/2015. Review by A_B3 on 9/15/2017. Review by Ironheart on 3/30/2012. I will try to make them different colors but since a lot of bonuses overlap I am not sure how I will arrange it, it isn't really much of a problem unless the creator of the match makes some bows/crescents/circles worth more than other bows/crescents/circles, but that wouldn't be very fair.